Entertaining with a professional chef in the house takes on a whole different meaning – my daughter comes up with the most amazing ideas and combinations of flavours. For our lunch guests on Sunday I wished to serve a light, bite sized munchie to accompany our cocktails. 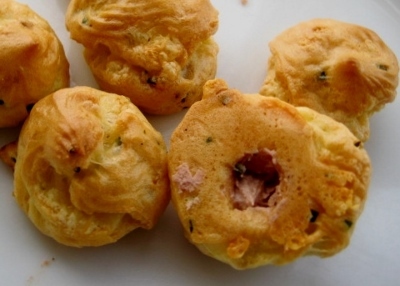 My Cheflette came up with the idea of a bite sized, savoury choux pastries made with Emmental (called Gougères in French) These are quite easy to make and the pastry can be prepared in advance to save time on the day. The stuffing is a mixture of creamy duck liver mousse blended with some truffle paste which gives a divine flavour. 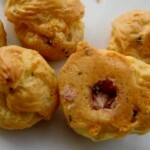 You can either fill the Gougères using a piping bag or just slice them across the middle and spoon the filling in. We served them with a Cocktail made by Nick Wilkins, a “French 75” which refers to a famous old French cannon which had quite a kick when fired, similar to the effect of drinking this cocktail which combines gin, sparkling wine, lemon juice and syrup. Just before serving fill the pastries with teaspoonful of mousse mixture.